New World Library, 9781577315155, 108pp. 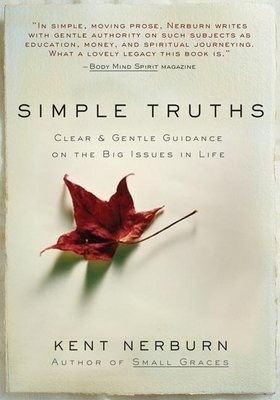 Seldom does a book come along that speaks to the core issues in life with the clarity and wisdom of Simple Truths. Drawing on the insights put forth in his widely praised book, Letters to My Son, award-winning author Kent Nerburn offers clear and gentle guidance on such central life experiences as love, work, possessions, strength, solitude, and death. This is a profound book, deeply informed by the spiritual traditions of the West, the Far East, and Native Americans, with whom the author has worked for many years. Its honest authority and moral focus appeals to readers of such classics as The Prophet and The Seven Spiritual Laws of Success. Its simple format and beautiful presentation make it ideal for the intelligent gift-giver looking for a small treasure.